short girl, long island. : The Man Behind Karmaloop's Killer Shoes. It all started last summer with my search for a pair of Jeffrey Campbell Lita's. I was chatting about sneakers via Instagram, with Karmaloop's former Lifestyle Marketing Director. I had casually asked if he knew when the store would restock black Lita's, which had been sold out everywhere. A week or so later, I received a reply from someone I didn't know, informing me that the Lita's had been restocked. I was thrilled with the news, and snagged the coveted shoes immediately. After my order was placed, I went back on Instagram to find out who had tipped me off to the restocking. Lo and behold, it was the head of women's footwear for Karmaloop, Joe Farese. No wonder he knew they were back in stock - he was the one who ordered them! Since then, I have picked Joe's brain on more than one occasion about shoes and fashion, and he has always answers me promptly. I'm not the only person who has noticed Joe's knack for stocking the hottest shoes around. Celebrities Jeffree Star and Jenna Jameson have both sported Karmaloop treats on their feet. I approached Joe regarding an interview, and he was more than happy to contribute. He spoke about his career in the industry, his influences, and creating the Jeffrey Campbell x Karmaloop collection (!!!). Joe Farese, Head of Women's Footwear at Karmaloop. You are currently the women’s shoe buyer for Karmaloop – what are some other jobs you have had in the fashion industry? Well when I was still in college, I did a summer internship for L.A.M.B. at their New York offices. That was my first step into the fashion world, apart from retail jobs. I also worked at Luna Boston, a local high end retailer who actually became really popular online for a while. 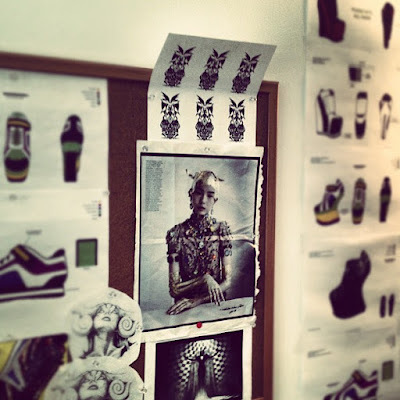 When choosing the shoes for Karmaloop, do pick the styles on your own, or gather input from your coworkers and friends? When I go to trade shows or showroom appointments it is usually on my own, however recently I hired an assistant buyer. I have been working with her for a year so it was more like a promotion for her. I now have her take a look at the orders before we send them in, just to be sure I did not miss anything or I ordered something that she thinks is terrible! We are so different; I want all black, studs and 7 or more inches high. And she is more of a flats and cute wedge or chunky heel. So we are a perfect match. Which fashion icons have had an influence on you? So many! When I was younger it was more musicians that had influence on what I liked and thought was cool. Bjork comes to mind as a BIG influence. 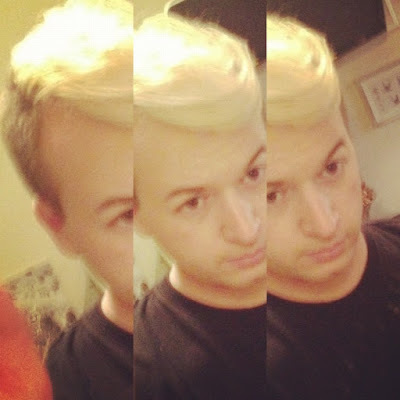 Before you say how is this kid a buyer and Bjork is his muse? Well take a look at her outfits over the years… I guarantee you 90% of them were custom Alexander McQueen couture pieces. She just gets a bad rap for that one avant-garde swan dress! But she is actually one of the most brilliant people alive today when it comes to creativity. Also she and McQueen were best friends… not many people know that, she actually sang at his private funeral service. Shooting new Jeffrey Campbell promo in the Mojave Desert with Bridgette from JC. What are some of your favorite shoes, from your personal collection? I was going to ask you what your favorite pair was, but I realized that it’s impossible to choose just one pair. That’s a tough question! While I do have a LOT of shoes, I usually cycle through them season to season, from the Karmaloop brands. I currently love my pair of Coltrane’s… I wear them literally every day! I also just got the Judas Spike sandals I can’t wait to wear all summer. I also love the soon to be released JC x Karmaloop collaboration shoes I designed. (YOU JUST WAIT!) Unif Hellraisers are also always in heavy rotation. For designer, my Vivienne Westwood pirate boots for Fall, my Rick Owens Suede sneakers for Winter and my Gucci runway 2009 loafers for Spring/Summer and my McQueen dragonfly iridescent dress shoes for fancy time! I heard there is going to be a Karmaloop x Jeffery Campbell collaboration. Would you be able to divulge a bit of information to the readers, or is this top secret? All I can say is its AMAZING (and not just because I designed the collection, shah)! They are truly out of this world. They are sneaker wedge hybrids… but more extreme than anything else currently on the market. The collection is entitled “Paradigm” and all you need to do is imagine Rick Owens, Gareth Pugh, Lady Gaga and an Alien had a baby….. They will be out in late June / early July….. Keep checking my Instagram for sneak peeks of the collection! Sneak peek at the Karmaloop x Jeffrey Campbell collection, Paradigm. What trends will take us through the remainder of 2012? What about 2013? Spikes! Spikes are still going strong, and will continue into summer then fall. Also sneakers are making a comeback, but heeled sneakers, and not tacky heeled sneakers. Lots of hidden wedges, platforms (but not all Spice Girl Platforms), and lucite heels are big along with geometric floral prints a la Givenchy. Not sure on 2013 yet, I will see the spring collections in August in Las Vegas! Are there any other realms of fashion that you would like to explore? Right now I am happy being a buyer, and I could not be luckier than to be working with footwear. Right now footwear is THE trend. You can wear a potato sack, and have a killer pair of heels and the outfit will be out of this world. 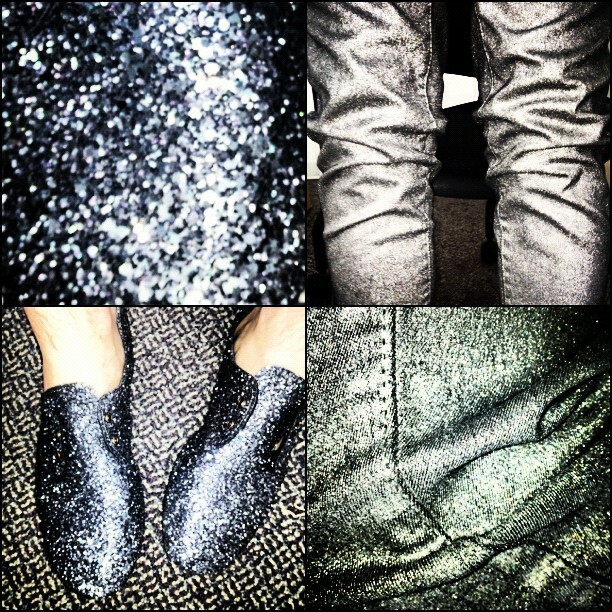 Anniel glitter shoes paired with H+M metallic skinny jeans. What are some shoes that every woman should have in her closet? BLACK. Anything and everything black and you cannot go wrong. Also people take you more seriously in the industry if you keep your look monochrome, at least that’s how I feel. How about for the gentlemen? Same goes for men, but also you need a good skinny pant (black obviously). Believe it or not I get mine from the girls section at H & M for $24.99! I have been since college, they are extremely tight and I can wear them every day. I buy them in bulk. Stay away from my size 4’s! Surrounded by shoes in Joe's office. 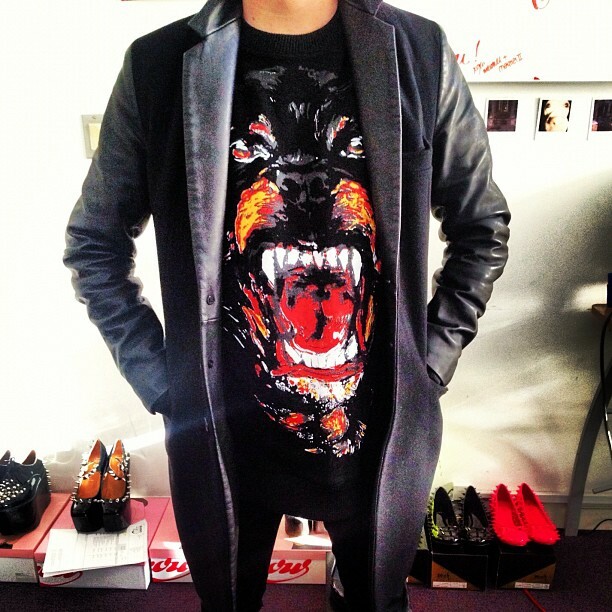 Sweatshirt: Givenchy; Jacket: Versace. If you could style anyone (alive, dead, or a fictional character), who would it be? Maleficent from Sleeping Beauty. And Madonna. Fashion and music go hand-in-hand, so a soundtrack that inspires and motivates is essential. Choose ten songs to share with the readers. I am so stoked for the Jeffrey Campbell x Karmaloop collaboration to arrive. While you wait patiently for its arrival, head over to Karmaloop and check out what Joe and his assistant have stocked the store with. If you use the rep code ShortGirlLongIsland, you'll save 20%, which is always a plus. If you're on Instagram, be sure to add Joe (bullshit_be_mine). You can also access the playlist with Joe's picks on Spotify - click here to listen to shoes, shoes, shoes. Drawings + inspiration for the Karmaloop x JC collection adorn Joe's office. What a great interview Michele! Great interview. I'm headed over now to check out the shoes.